Have you come across people who now eat all vegetables which they hated as kids? My husband is one such. He never touched pumpkin, gourds and the like in his childhood but these days eats them quite cheerfully. This underscores my view that people (and children especially) dislike not the vegetable, but the way in which it is cooked. My hubby agrees with me now that dishes made with pumpkins can be tasty! Besides, pumpkins are nutrient rich as shown in this article in the Mayo Clinic Health System. I use yellow pumpkins in my menus from time to time. 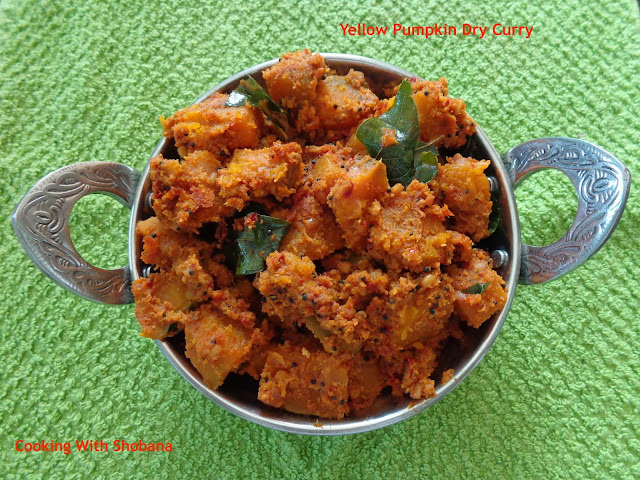 Elsewhere in this blog, you will find recipes for Yellow Pumpkin Kootu, Mathanga Pulinkari, and Ash Gourd Pumpkin Coconut Stew. Yellow Pumpkin is called Parangikkai in Tamil, Kaddu in Hindi, Kumbalkayi in Kannada and Duddhe in my mother tongue, Konkani. 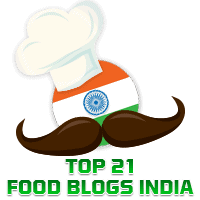 Today's recipe is adapted from Parangikkai Curry from the popular blog, Rak's Kitchen. We tried this out the other day and enjoyed it very much with rice and rasam. In a small mixer jar, grind together the fresh coconut gratings, red chillies, cumin seeds and small onions to a coarse paste using just the required amount of water. Keep aside. Cook covered over medium flame for 4-5 minutes till the pumpkin gets done, stirring from time to time. Take care that it does not get overcooked as pumpkins tend to get cooked quickly.